The bikes approach the trip wire. Matt and Ryan run through the trees, but they're too late - Todd has been thrown off his bike. 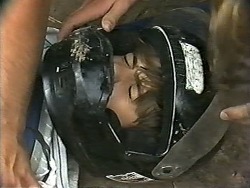 Matt and Ryan lift his helmet visor. Lochy is trying to get Joe to play with her, but he's doing his accounts. Lochy is missing Toby and so is Joe - but they couldn't afford the airfare from Darwin this holiday. Lochy decides to take Bouncer for a walk. LOCHY: Don't tell him I said it. But I really miss Toby. JOE:(to himself) Yeah. Me too. It seems that Todd is OK, he's just hurt his leg. Boof is ranting about Lester, claiming he's going to deck him. Matt says it's Boof's fault anyway for threatening Lester. Kerry takes Boof on and tells him what damage he's doing to the park. BOOF: Oh hell, a greenie. That's all I need. Kerry stand in front of his bike as he starts it up. Joe has come round to see Jim and give him the bill for some work. Jim is in a bad mood and Joe says he saw Beverly shoot through earlier. He thinks that Beverly is on a trip and Jim doesn't correct him. 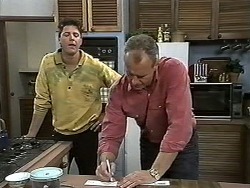 Kerry is telling Boof about the damage he's causing. She says there must be an alternative to the park - in any case, riding at the park is illegal. Boof won't have it though and says he'll ride anywhere he wants. He rides off with his mates, unrepentant. Todd, Josh, Cody, Melissa and Ryan are heading off. Melissa thinks that Todd should sell his bike, but Cody thinks trail bikes are great! Todd says he'll hide his bike from Beverly again. Beverly comes in and isn't very pleased to see that Jim is there. Jim says he hasn't seen Todd and Beverly accuses him of not caring. Oh, shut up, woman. Jim says that moving out at all is affecting Todd even more - they promised him a stable home. Ryan is working his shift when Boof and his mates rock up. They sit down at a table and taunt him. They break a few dishes and say that the next thing they smash will be Ryan's face. Kerry has made Matt a cup of grain tea that he is struggling with(!) Matt wonders where they can find for the kids to ride their trail-bikes. Joe comes in and says he's heard they've declared war on the bikies. Kerry wonders if she could talk to the council about somewhere else to ride. Joe says he might know somewhere - a filled-in ex-rubbish tip in Anson's Corner. Kerry is chuffed. Josh and Todd come in. Todd's ankle is still hurting but he's not too badly off. Jim comes out and asks Josh if he minds going home, they have some family things to sort out. 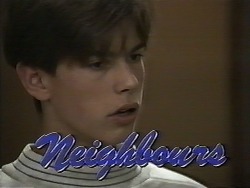 Todd is upset and angry and blurts out that he doesn't want to move in with Beverly. Jim says that Beverly has the last say when it comes to Todd's welfare. 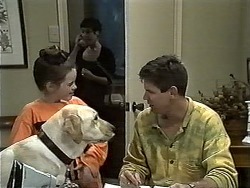 Todd rants that Jim said he could have a family and home with them, but he lied. Beverly comes out and tells Todd that he's coming with her. He flatly refuses. TODD: You can go to hell! Beverly is very angry with Todd and tells Jim that she won't be talked to like that by a child. Beverly reckons the only reason Todd wants to stay is because Jim is slacker on discipline(!) Jim reasons that the separation is only temporary - why not let Todd stay on with him. Beverly reluctantly agrees to ring Todd's mother and ask. Lochy has brought Bouncer home. Kerry answer the phone and suddenly scary music plays. KERRY:(faintly) Oh, no! Yeah...yeah, I'm still here. Yeah, I'll tell him. (upset) Well, thanks for letting us know. KERRY: I'm sorry Lochy, but you're going to have to go home. KERRY:(trying not to cry) I'm sorry...but can you just go. I've got to talk to Joe. JOE: Not Toby? Nothing's happened to Toby, has it? JOE: Well what is it? KERRY: She was looking after TOby while Nolene went shopping. KERRY: Nolene was crossing a pedestrian crossing and she was knocked down. She's been killed instantly. Kerry sobs and Joe looks shell-shocked. Matt answers the door to Ryan. He's come to offer to help pay for the damage to Todd's bike, but Matt's willing to do it. 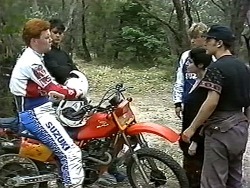 Ryan moans about not having anywhere to ride, and Matt tells him about the disused rubbish tip. It still doesn't mean that Boof will stay away from the park though. Ryan reckons if Boof hassles him again, he'll flatten him. Matt tells him that Boof simply isn't worth it. Kerry and Joe are sitting in silence, trying to take in the news. JOE: Aw...we used to fight like cat and dog. But I cared for her in spite of everything. JOE: We got married too young. That was our problem - rushed into it. But Toby was on the way, you know...all we seemed to do was fight and...(upset)...we were always broke...she seemed to nag me all the time. Nothing I could do was right. Guess I made her feel the same way. Wasn't real easy to live with. I didn't mean to make her unhappy, though. KERRY: Of course you didn't. Sometimes things just turn out that way. JOE: Yeah. Got to the point I didn't even want to go home, you know? Sitting around the pub...made things worse. Finally get home, she'd yellat me and I'd yell back. Kid'd be crying. I couldn't cope. So I shot through on her. And little Toby. it was a mongrel thing to do. KERRY: Joe, we all make mistakes. JOE: For so long...I thought I hated her. But I didn't! 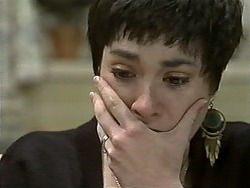 Then when she came back again with Toby, you know, I realised a lot of it was my fault. She was a decent sort, you know. (crying) I guess I loved her, you know, before we started ripping into one another. She would have had a better deal, you know, if she'd lived with someone else. KERRY: Then there'd be no Toby. JOE: Oh, the poor little, kid. I've got to get up there, mate. Got to be with him. KERRY: Well, we'll see how soon we can get you on a flight, eh? KERRY: That doesn't matter. Toby needs you as soon as possible. JOE: Poor little kid. And what do I say to him? How do you make sense of something like this? 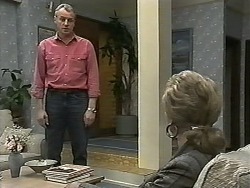 Todd comes in late and Beverly tells him off - she's been waiting three hours for him. 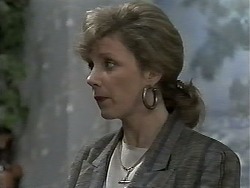 She's rung Todd's mother and she wants Todd to go back to Adelaide while Jim and Beverly work out their differences. 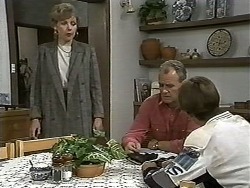 In the end, it's a choice - he either lives with Beverly in the flat or he goes back to Adelaide. BEVERLY: So. What's it going to be?